It took Mike Nickeas a long time to reach MLB, but when he finally did, he proved capable if unspectacular. 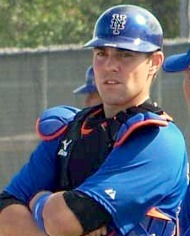 The Canadian-born catcher spent seven years in the minors before grabbing a cup of coffee with the Mets in September 2010. Thanks to visa problems, injuries, and the end of a drug suspension for Ronny Paulino, Nickeas was able to parlay that coffee klatch into a spot on the Opening Day 25-man roster in 2011. But it wasn’t all because of Paulino’s problems that Nickeas made the big club; the career minor leaguer proved to be a reliable and solid “catch and throw guy” who seemed to have a strong rapport with the Mets pitching staff. Nickeas was sent to AAA after Paulino finally joined the Mets, and didn’t return until August. While serving as a backup in both Buffalo and Flushing, Nickeas showed very little offensively, but definitely established himself as a fine handler of pitchers and displayed above-average defensive skills. From the perspective of a professional catching instructor, I don’t love his technique, but he gets the job done better than most and he appears to be the catcher that every Mets pitcher wants to throw to — a factor difficult to quantify, but trust me, is a huge asset. Nickeas was no Charlie O’Brien back there, but he was a huge upgrade over Josh Thole and a few ticks better than Paulino. Unfortunately it wasn’t enough defense to overcome his meager offense; his dramatic homer in game 19 was the highlight and peak of his season. As much as I like Mike Nickeas, I was completely stunned that the Mets included him on the offseason 40-man roster; did they really think that another team would jump at the chance to pick a 29-year-old, .180-hitting, third-string catcher in the Rule 5 Draft? Seems to me to be a waste of a roster spot, since there are at least two dozen catchers exactly like him throughout AAA. That’s not to say I’m upset; in fact, I’m pleased to know that Nickeas is likely to be in Port St. Lucie come February, and presumably part of the organization’s catching depth in 2012. My guess is he’ll be exactly what he was in ’11: a defensive-minded, backup backstop who can be shuffled between AAA and the bigs as necessary. And within the next 3-5 years, we may see Nickeas move into a minor-league managing post — perhaps in preparation toward a more successful MLB career. I disagree with your projection of Nick long term. I think he sticks in the majors for some time and is far more valuable than you realize. While there’s plenty dime a dozen third stringers, Nickeas’s outstanding mental makeup, calm, work ethic, leadership abilities and fine defense separate him from that pack and makes him valuable asset like a Todd Pratt and eventually, Henry Blanco. Nickeas is on the 40 because the Mets like his make up and defensive tools and it’s possible Paulino wont stick. If Nickeas doesn’t make the team out of spring training, he becomes enormous asset at AAA working with pitchers there. I also think that with greater attention to offense, Nickeas has the tools to put up respectable numbers. Where I do agree is in Nickeas’s potential foray into managing and coaching, that should he pursue that, I think he’ll do very good job. I think your comparison to Todd Pratt is unfair; Pratt was a solid defensive catcher with above-average offensive skills, including home run power. Blanco is a closer match, though I don’t believe Nickeas is as good defensively as Blanco was at a similar age. Believe me, I like Nickeas as much as anyone, but I also recognize that there are many, many catchers exactly like him. I look at tools, approach and mental makeup rather than the past to project forward. I’ve seen far too much baseball and late bloomers to assume than x-player won’t succeed because he hasn’t yet done so. Nickeas has a nice swing and at times displays excellent plate discipline. What he needs is to focus more on his hitting as ticket to stick in the Big Leagues whereas his D and mental makeup got him here. I also look at tools, approach, and makeup, while also taking past performance into consideration. Based on the tools I’ve seen in Nickeas’ tiny sample size at the big league level, I can understand why he’s been a .220 hitter in the minors — he has a slow bat and poor pitch recognition. I’ve not seen anyone over the age of 25 suddenly and drastically change those specific weaknesses without the aid of PEDs. I’m curious about these late bloomers you speak of — could you name a few examples that compare to Nickeas in terms of skill set, experience, and age? I’m not being a smarty pants, I’m genuinely curious.The only guy I can think of is Brian Downing, but Downing had shown some power and discipline prior to his breakout ’79 season (I also think he might’ve been “experimenting” with some horse medication back then). Maybe Omir Santos? Omar Santos is indeed good example of a player written off as no chance to hit who opened eyes when he got his first legit chance in the majors in his late 20’s. His defense, however, at least to that point as Met, was his ticket back to the minors. I just don’t agree with your philosophy of writing certain players off at a certain age based upon past performance. I don’t believe in arbitrary, age-related, 20-something cut off points, especially in someone with valuable skills and tools. One of the greatest shortstops ever, Ozzie Smith, was all-field, no hit through 3,300 major league AB’s through age 28, but then developed into respectable hitter. Our own RA Dickey didn’t find success until reinventing himself in his 30’s. I think Nickeas (28, not 29) has the tools to hit – that bat speed isn’t the problem, but rather timing, committing too early, being pull happy, not staying back on ball, nor using enough lower body and good plate approach to drive the ball where pitched. I think he’s spent a lot of time on defense to the detriment of offense and needs to correct that mechanically and better plate plan and approach. He impressed the Texas Rangers enough to draft him in the 5th round, 141st overall in 2004. Looks to me he was prematurely rushed up the ladder thereafter, moved to AA in his second pro season, moved up and down without staying long enough in Advanced A to hone his offensive skills as foundation to succeed in AA where he struggled for years therefater. Within a year after the Mets obtained him, they rushed him him to AAA when he hadn’t even yet succeeded offensively in AA in either organization.The point being Texas and the Mets prioritized defense and sacrificed his offensive development to fill organizational need. The one offensive asset I can point to is that Nickeas seemed patient enough to take his walks when hitting 8th. I know that’s faint praise, but there’s nothing more frustrating than a guy who gets himself out when the other team’s just trying to get to face the pitcher. Yes, exactly. I’ve noticed that too, argon, – his capacity to be very selective at the plate with air of calm in doing so. Nickeas: Its obvious the Mets like him. But I think he is on the roster as insurance. I think The Mets need a catcher on the roster in case they trade Josh Thole. I also am curious to see the fates of Pelfrey and Pagan. Nickeas is on the roster for one reason. If the Wilpon’s and Selig tell Alderson that Paulino can’t be paid arb money and the Mets can’t find a cheap replacement Nickeas fits the bill at minimum salary. Otherwise despite the love affair for him above, he isn’t major league material. He hasn’t learned to hit by 29 and does anyone think he is so dumb that he hasn’t tried to learn to hit to make the big bucks. If he’s that dumb he shouldn’t be around hanfdling a pitching staff. But the pitcher’s like him.. Which means he isn’t dumb since he can call a game. That means he just can’t hit. Like the vast majority of the world.